« A Nice Stack ! 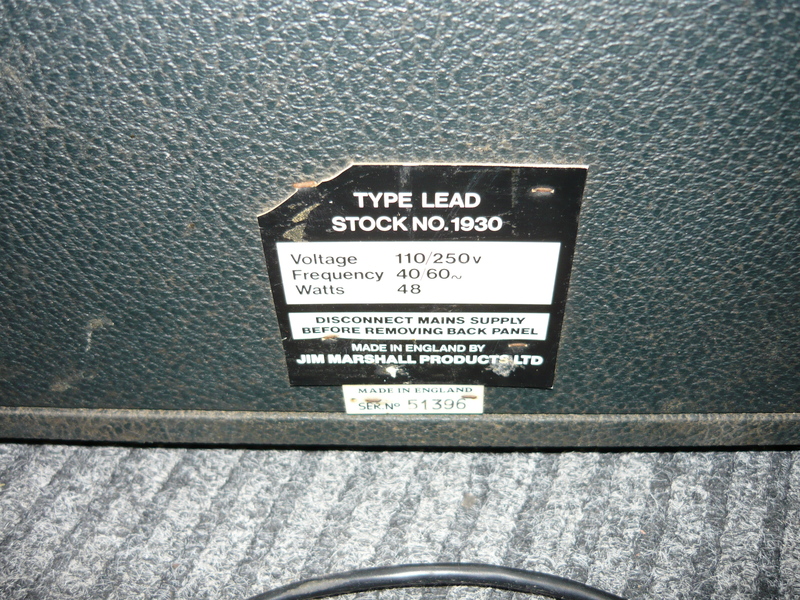 The subject of this week’s blog is the Marshall JMP era model 1930 10 watt tremolo combo, designated the 1930 ‘Popular’ in Marshall histories and catalogues, but designated as the model 1930 ‘Lead’ on the amp itself. This amp is extremely rare in the land of OZ (this is the only example we have ever seen), and in fact we reckon it would be a rarity just about anywhere. Basically, the 1930 is a 10 watt combo amplifier with a single 12 inch Celestion speaker. Two channels, each with two inputs and separate tone and volume controls for each channel. A valve (tube) generated tremolo operates on all four inputs with intensity and speed controls. 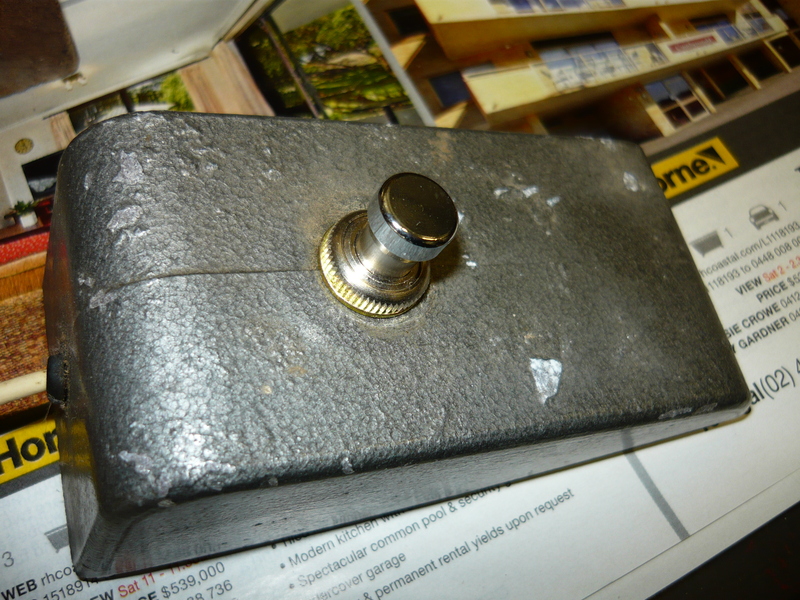 A tremolo on/off footswitch completes the package. The valve (tube) complement is a pair of 6GW8/ECL86 triode/pentode valves for the push-pull ouput stage and phase-inverter stage, and a single 12AX7/ECC83 for the preamp. 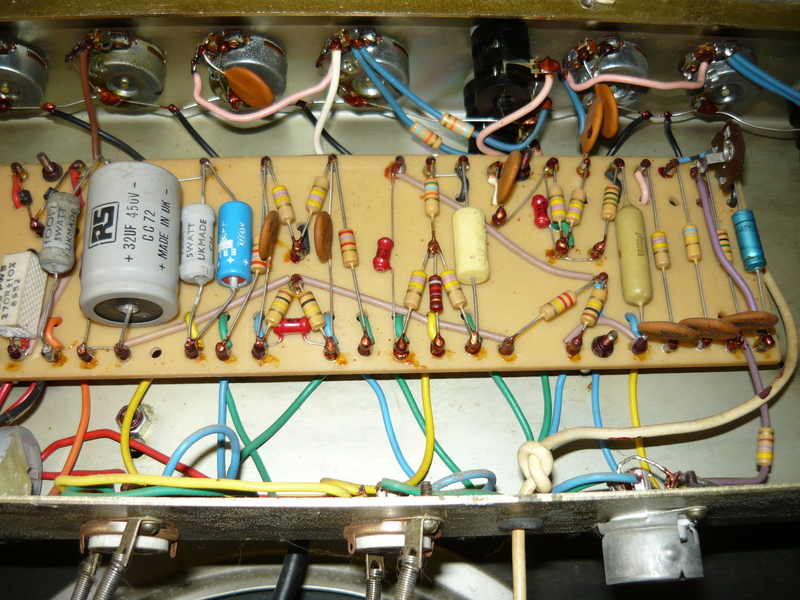 One half of the 12AX7 is used as an oscillator for the tremolo, so that leaves only a single gain stage in the preamp. For those of you who are unfamiliar with the 6GW8 valve (tube), a.k.a. the ECL86 in the UK and Europe, this valve combines a pentode power valve, with 9 watts anode/plate dissipation rating, so think of it as similar to the well known 6BQ5/EL84 but with lower power ratings, plus a triode similar to one half of a 12AX7/ECC83, both in the same glass envelope, with the standard miniature 9-pin base. A pair of the these valves can theoretically achieve an audio output of up to 14 watts, in class-AB/cathode-bias operating conditions. 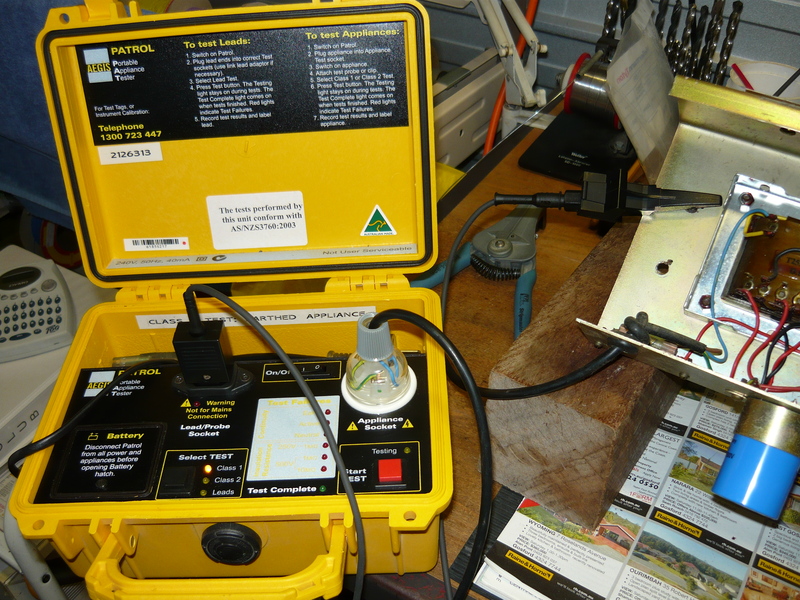 The 6GW8 was manufactured in Australia by AWV (Amalgamated Wireless Valve), and I’m sure in several other countries. Manufacture ceased a long, long time ago, so we have been relying on new-old-stock for years. 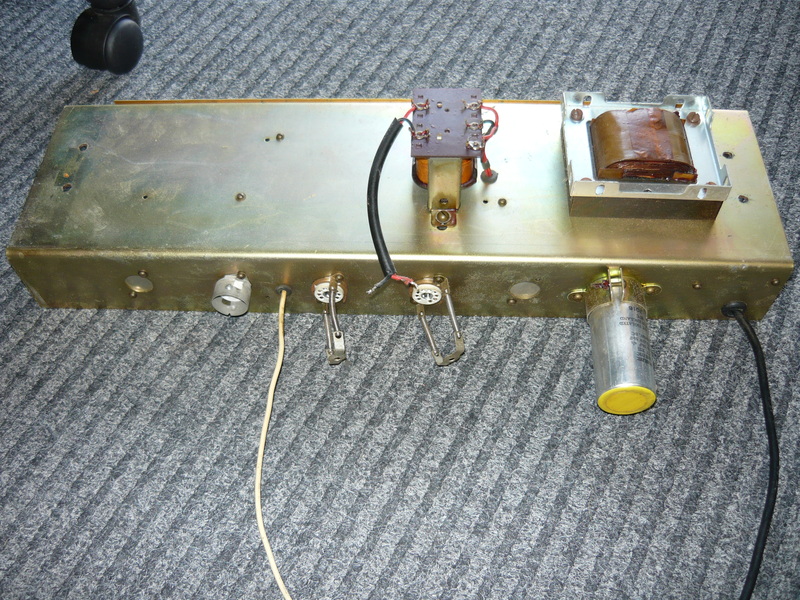 The 6GW8 was widely used in Australia in domestic electronics as well as guitar amps under 20 watts. Typically, amps that developed about 14 watts rms, would have been sold as 20 watts (ie, “music power” rating). Aussie guitar amps using the 6GW8 would have included Vadis, Moody, Goldentone, Challenge, Diason, Kee, no doubt the list goes on and on. The pentode section was also used as a reverb driver, especially in Goldentone amps, with the triode section used for gain recovery after the reverb springline. This amplifier came to us from Bondi Intermusic, barely producing any musical sounds at all and in need of a major overhaul/refurbishment. 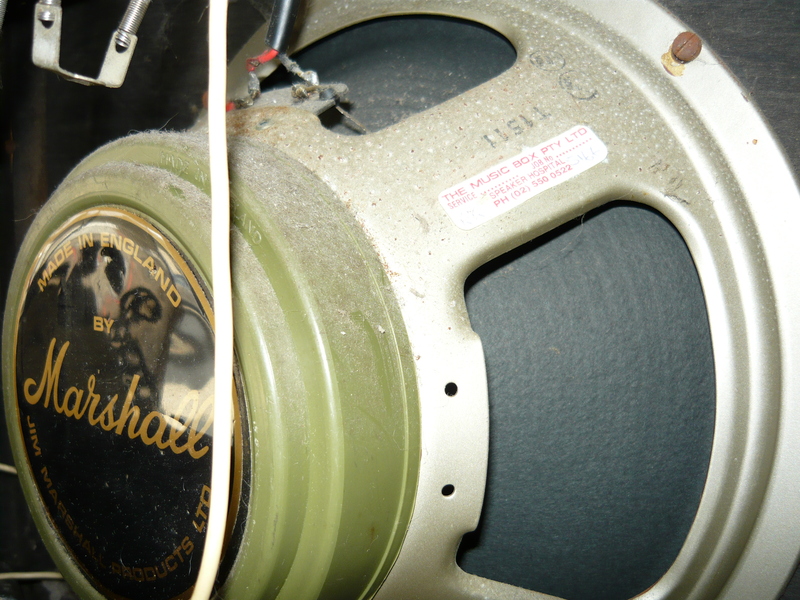 Fortunately, both transformers were OK and the apparently original Celestion ‘Greenback’ speaker was working fine too, although it had been reconed in Sydney at some unknown point in its history. The existing valves were definitely past their use-by date and the 9-pin valve sockets themselves were only providing intermittent connectivity, even after a blast with DeOxit. 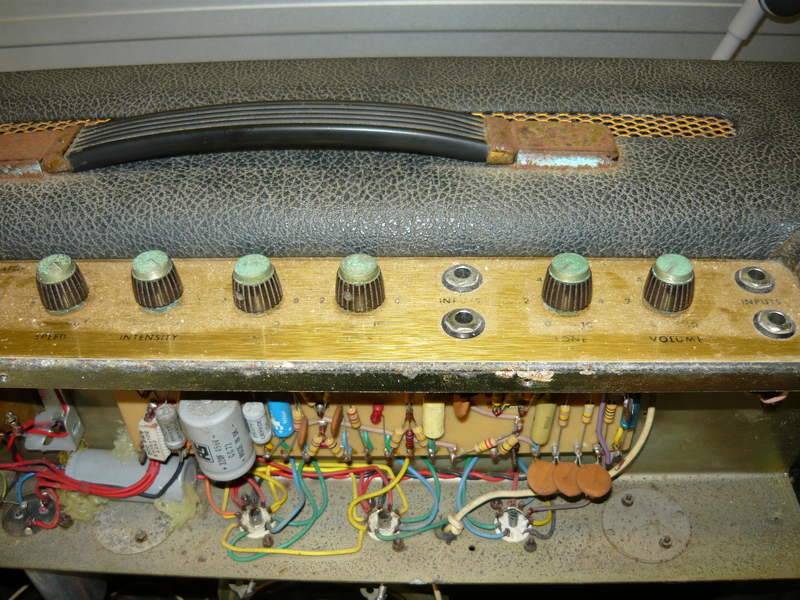 Here are some “before” and “after” photos of the amp repairs. The first three shots show the board and hand-wiring. All three 9-pin valve sockets would need to be replaced. Even after replacing the 9-pin valve socket, the tremolo only worked intermittently. This necessitated replacing the board-mounted trimpot, and the footswitch (which is hard-wired into the circuit). The impementation of the tremolo effect is very similar to that in the famous Marshall 18 watt combo, but this amp design has much less preamp gain. Because the volume and tone controls plus channel mixing components are placed before the single 12AX7 gain stage, this stage is running wide open without any post-gain volume control to moderate noise levels. Therefore, we found it necessary to install a selected low-noise “high-grade” 7025 valve in this socket. Because we are relying on a diminishing supply of new-old-stock valves, it is next to impossible to source the 6GW8’s in matched pairs (ie, the pentode sections). You will be lucky just to get a pair of the same brand. We were able to source a pair of made-in-UK but labelled Sylvania, in their original packaging. 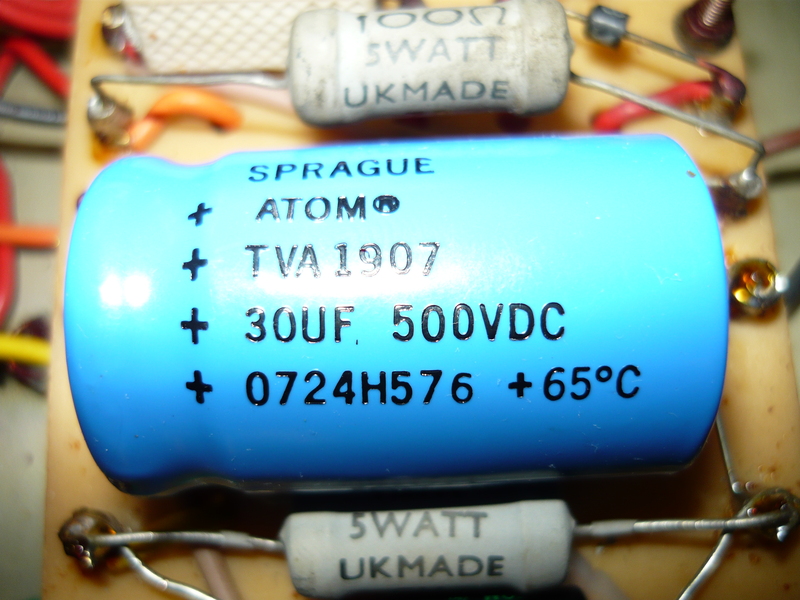 This amp, like most similar amp designs, relies on a single cathode bias resistor, common to both (pentode) valves, to achieve the correct bias level. Due to the fact that the 6GW8 parameters might be all over the place, it would be prudent to bypass this arrangement altogether, and install two separate cathode resistors (of double the original value each), bypassed by separate capacitors. With this approach, each 6GW8 will self bias to approximately the same level, and this is exactly the solution we implemented. The original components are still on the board, but somehow we doubt that anyone will start manufacturing the 6GW8 again ! You can see from the next two photos that we have now replaced the power supply filter capacitors, firstly a can-mounting 32+32uF unit, and secondly a board mounted axial lead 30uF/500V. A couple of badly worn pots needed replacing. The new cathode bias components installed were a pair of 270R W22 series ceramic body plus a pair of Sprague Atom 50uF/50V axial lead bypass caps. While setting up the new cathode bias arrangements we discovered an internal earth loop within the amp which was creating an unnecessarily high level of hum ! Rerouting the earth return path from the 6GW8 cathodes directly to the earth connection of the first filter cap corrected this problem, by removing this heavier current from flowing via the preamp circuitry. This amp would have been noisy right from the factory. 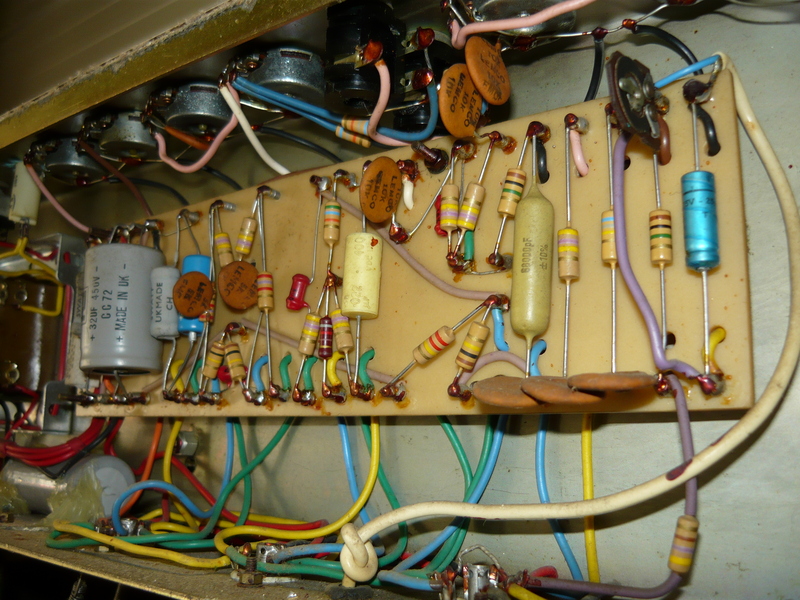 All amplifiers need to be tested for electrical safety compliance, especially an amp that is about 40 years old ! All that was needed in this case was a new 240V 3-pin plug. 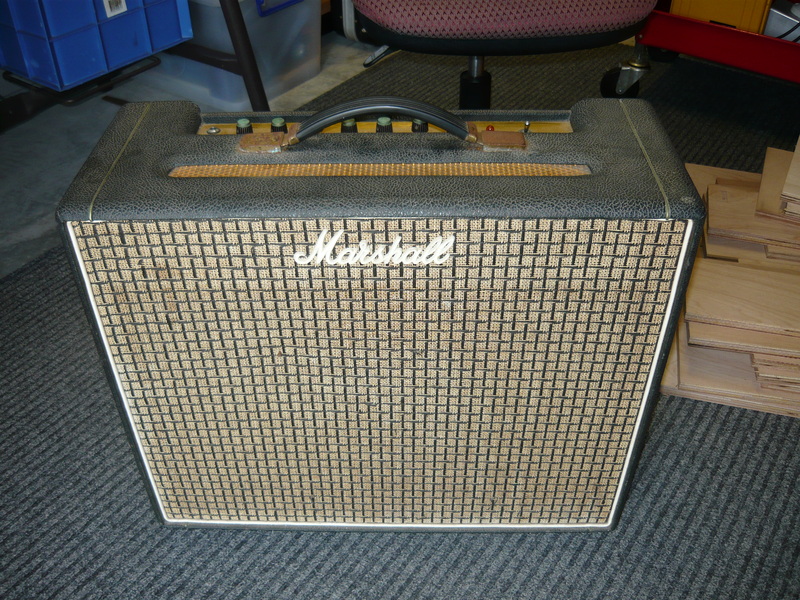 Thanks to Mark W., for sending us this unique example of vintage Marshall/JMP production. We also have a 1963 Vibrolux from Mark for a major overhaul, and attention to electrical safety issues, which will be the subject of a future blog. I have to admit, when first confronted with this JMP, fully expecting problems sourcing quality 6GW8 replacements, I tried to persuade Mark to allow us to convert the amp to EL84 output valves. 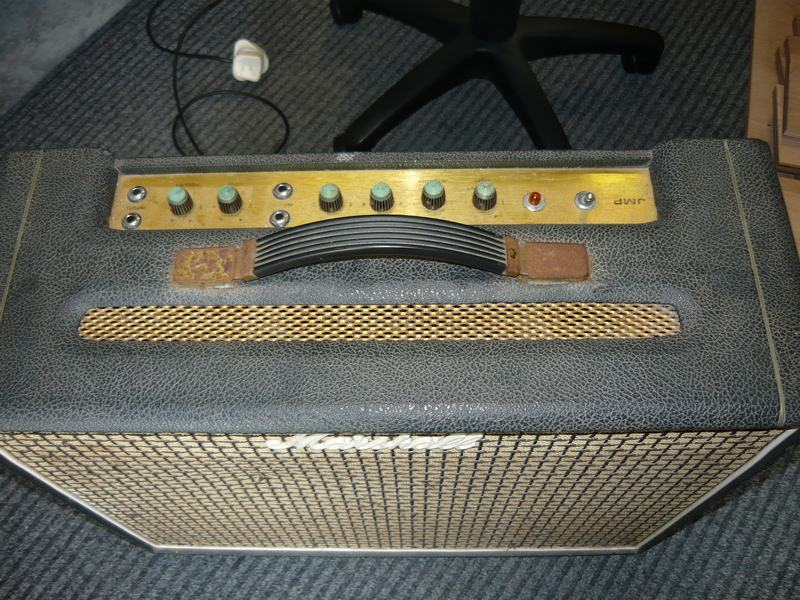 However, Mark wanted to keep the amp as original as possible, and he was proved correct in this choice, as the overhaul was completed successfully and only slightly over budget. See you next time ! 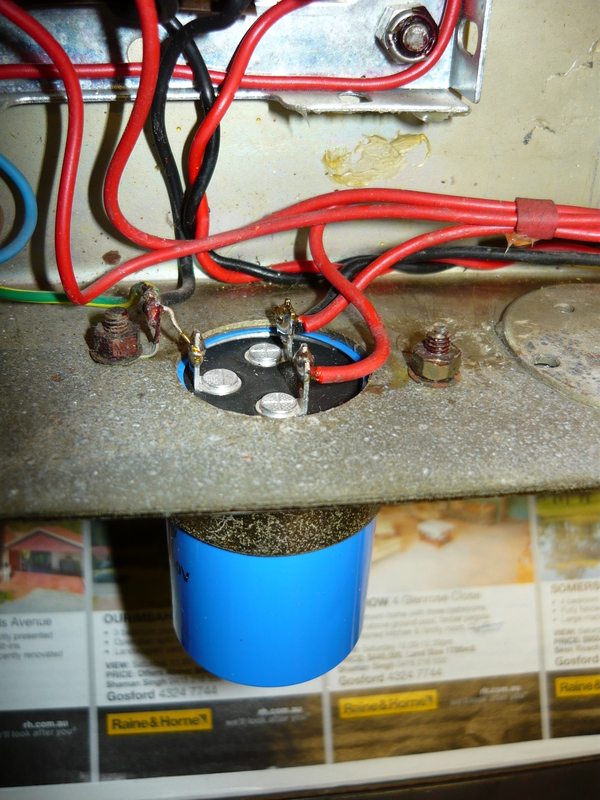 This entry was posted on March 1, 2012 at 10:53 am and is filed under Amp Repair, Amps. You can follow any responses to this entry through the RSS 2.0 feed. You can leave a response, or trackback from your own site. 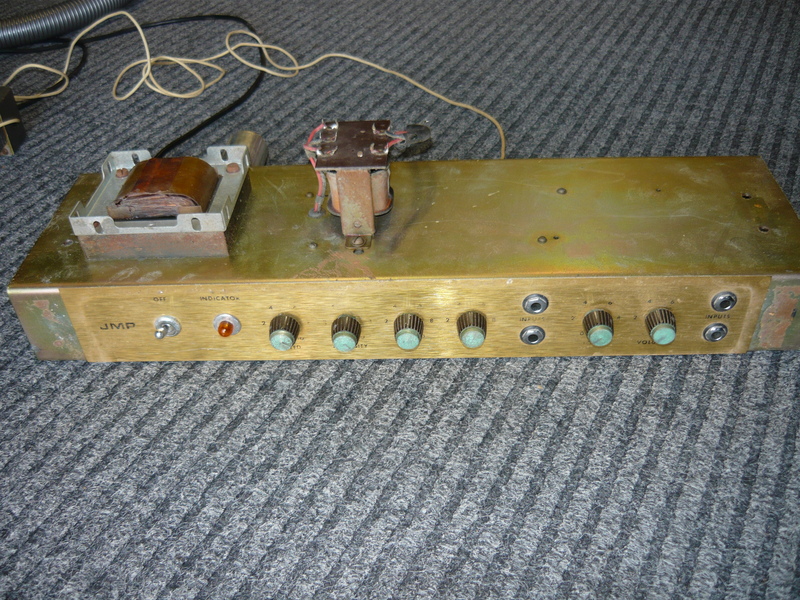 thanks, John, for your interest, more valve amp restorations waiting to be blogged, please stay tuned. hello Fran, I believe there was a version with 2 x 10-inch speakers; the old Marshall amps are indeed hand-wired (pre 1973 ? ); we cannot assist with the resale value of vintage amps; IR. So when the restoration was complete, honestly, how did it sound? I have heard several people say that these amps were poorly designed from the begining; and, therefore extremely noisy. I have also heard that the “pre gain stage” tone controls are completely pointless and just mimic the tone controls on the guitar. That being said, I see these amps for sale from time to time and I am still tempted to get one. In your opinion are they worth it or should I just stick with the good old tweed Fenders? hello Jack: well….the collectability of any given vintage guitar amp is very much a matter of personal choice; this is a very low gain amp with the most basic of controls although the tremolo works well once restored, but the amp is relatively quite rare and has its own charm for vintage Marshall collectors; the example in the blog was very noisy indeed, but the issues contributing to this were corrected one by one, as you will read in the original blog; IR. I’m having a heck of a time getting replacement matched ECL86 tubes. If anyone knows of a source, please let me know, much appreciated. Good article from someone who knows valves! I have one for repair, concerned that the ceramic caps may be causing noise at the front end. Have largely worked out the cct but a reference would be good. 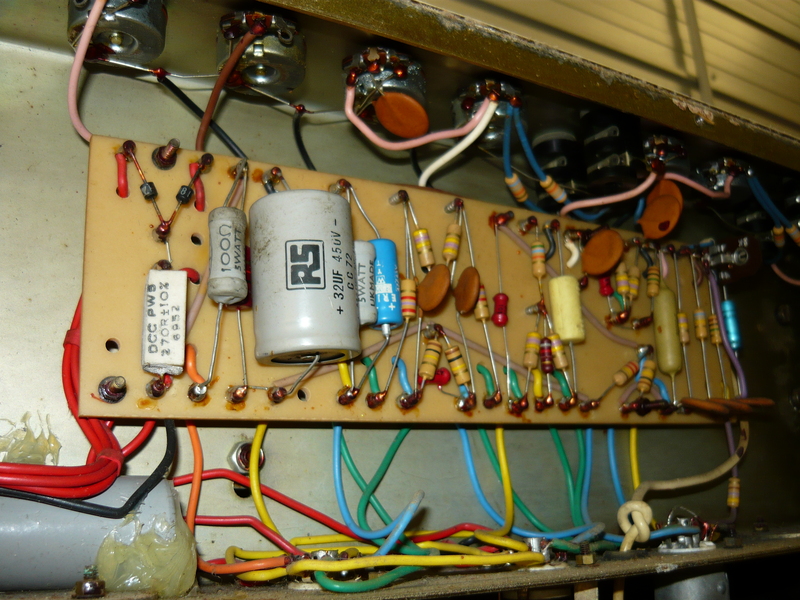 Hello Mike: the schematic for this model has been published in various guitar amp books. IR. I have one on my bench right now, probably from 1972 or 73. The tremolo wasn’t working and I’m having some difficulty with it. I’d gladly see some more pics of yours if you have any, particularly of the way you wired the tremolo footswitch and also that cathode and bias section. Thanks! It sounds great!